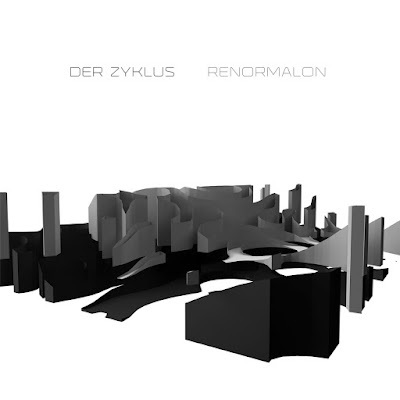 The new Der Zyklus release, Renormalon, is a six track mini album on 12" vinyl, on the Belgium label, WeMe. The music this time around is extremely different from Der Zyklus' Axonometric EP from last year, with very few beats and more of a focus on the background sounds and textures. 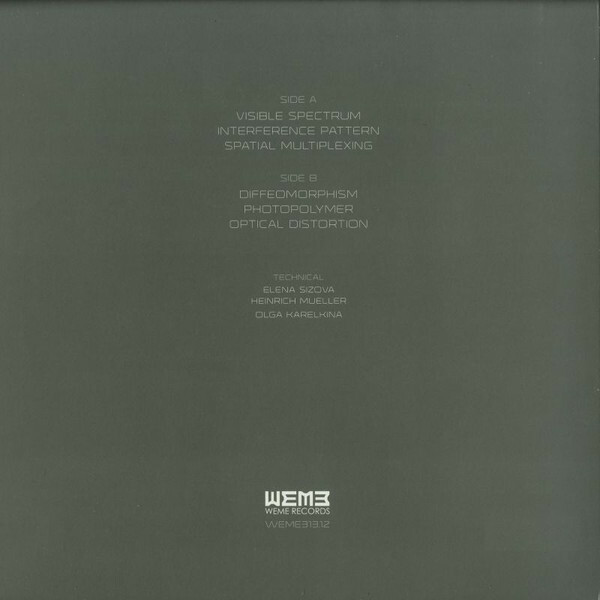 However in recent times Der Zyklus did include a track, 'T4', on WeMe's 10 year anniversary album, WeMe Ans (2014), which would sound quite similar. Not to mention Der Zyklus' debut album, Biometry (2004), is pretty damn experimental too. Even though in live performances as Dopplereffekt Mueller is joined by another member, there is a kind of presumption abroad that since at least 1999 he has been working alone in the studio as Dopplereffekt, Arpanet and Der Zyklus. We might be dead wrong about this but it is a surprise when another collaborator gets credited here, Elena Sizova. All that is known about her is that she is a DJ and producer from Minsk, Belarus. There is also a third collaborator in this particular project, the mysterious Dr Olga Karelkina, who was responsible for the LP artwork I think and the beautiful video for 'Diffeomorphism', which strangely disappeared from YouTube after a day or so. The press blurb from WeMe states the albums "purpose technically is to visually and sonically communicate the renormalon physics principle. Each composition is a separate component of the theory representing a particular phenomenon in the realm of quantum uncertainty.The observer is to be immersed conceptually and hopefully will experience discrete states of energy which is integral in atomic behaviour." I would guess one of the collaborators penned this description, which makes their intentions for this release very clear in one respect. At the real risk of adding more confusion, from my own research into the subject I think it's worth adding that paradoxes are common in this realm of the very small and the Uncertainty Principle implies that the more precise we are about one aspect of the quantum particle the less sure we can be about some other aspect of it. A renormalon itself is a particular source of divergence in Quantum Field Theory and also a possible type of singularity, which is always a potentially very special discovery to make. They have certainly picked one of the 'weird' and potentially amazing subjects of Quantum Theory with this project for sure. All of the tracks here could easily represent and soundtrack this aspect of Quantum Theory but in an emperors new clothes kind of way, they could also quite possibly represent any number of different subjects as well. Long after the concept has been forgotten it will always be the music that counts. Importantly for the listeners imagination, the LP design doesn't include anything other than the artwork, titles and personnel. The droney and beatless opening track, 'Visible Spectrum', very much sets the tone for the album with an organ rising and falling in an elegant and almost overwhelming way and very little else outside harmonics caused by the random overloading of the organ itself. 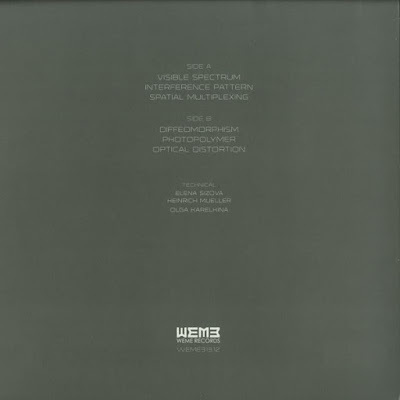 'Interference Pattern' has pops instead of beats but it is a rhythm none the less with some very sparse layers of synth-type sounds continuing to creep in and out of the mix. It's all quite ghostly as an inference pattern might behave. At the 5 minute mark the pops suddenly drop out, leaving us with just the other sounds echoing about in the atmosphere. 'Spatial Multiplexing' sounds very much like an emergency alarm, very like a moment from a film's soundtrack (which is an area I've always thought that Mueller could work very well in). The second half morphs into what sounds like the radioactive decay of the first section. 'Diffeomorphism' opens side 2 and is quite lush in a way and by far the most accessible track and my favourite, it doesn't surprise me that it was used for the video. Beats appear about halfway through and they really get the track going. The track is quite majestic and mysterious, just shimmering into existence and then disappearing again, a joy. 'Photopolymer' is much more contemplative, just rolling along in a very delicate and seductive pattern with some slightly off key sounds. 'Optical Distortion' is like some kind of uneasy weather pattern, it has a randomness that reminds me of the wind. The sort of track that could play for ever in the background and still be interesting as it has a very naturally evolving quality to it, like some exotic fungus on a petri dish. Like most of Mueller's work since Dopplereffekt's Linear Accelerator in 2003, this is another grower, which forces you to very much change your perceptions of what music can be. For me, while it does have a lot of changes of mood for just six tracks, with a kind of uneasy resolution at the end, there is enough variety and one really standout track to keep me interested throughout. It can be downloaded from WeMe here and purchased on limited clear vinyl direct from WeMe here and on black vinyl at various online and real stores. Nice Review there Stephen, yep I agree on the growing aspect like most GD tracks, and also the soundtrack vibes....someone just needs to make a film now!